Meet Peyton our office pup in training! 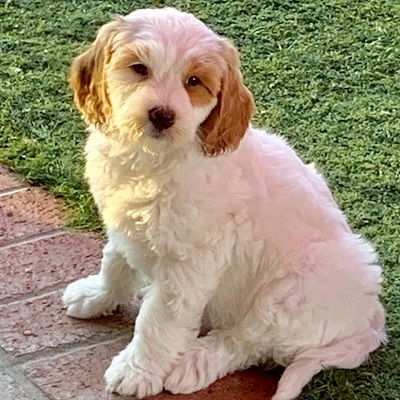 Peyton is an Australian Labradoodle sent to us all the way from sunny California. Australian Labradoodles are an intelligent breed that responds well to the rigorous training required to develop a therapy dog. They have a good temperament and love being around people. In addition, Labradoodles seem to have a special gift of empathy with human beings. The physical characteristics for which they were originally bred – their non-shedding, hypo-allergenic coats, lack of odor, and sturdiness – also make them particularly good candidates for working in institutional settings. Pet therapy animals are pets trained to provide affection and comfort. Numerous studies have investigated the benefits of therapy dogs on people's mental and physical health. Therapy pets help calm patients and may reduce anxiety in children and adults with dental phobias. Research has shown that therapy dogs can improve overall health by lowering blood pressure, providing comfort, and ease the nerves of anxious and fearful patients. The psychological benefits of therapy dogs are well-documented. In our effort to make each and every patient as comfortable as possible, we are proud to offer this as an option for you. We want to make it known that this is available, but we do not want to concern anyone who is afraid of or severely allergic to dogs. Please let us know if you fall into this category!